Georges Mathieu was born in Boulogne-sur-Mer in 1921. Before undertaking the artistic career he spends several years teaching and working as an interpreter, beginning in parallel, since 1942, to develop a passion for painting. 1944 will be the decisive year for the evolution of his poetry and his style when he begins to paint non-figurative paintings, as an autodidact. 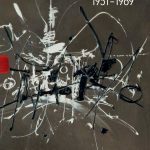 Since 1947, when he settled in Paris, he takes part in the theoretical debate by organizing a series of exhibitions and events in favour of an art free from all constraints and classical schemes: the Lyrical Abstraction. In the beginning of the fifties Georges Mathieu presents already all the characteristics of his best production; from 1948-1949, the artist stands out for its unique colour application, directly from the tube: technically he traces his “scriptures” squeezing the pure colour from the tube, managing in this way to draw and paint at the same time. 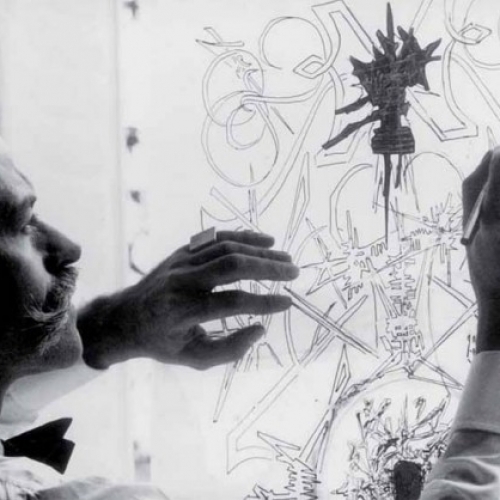 He exhibits for the first time in 1946 at the VI Salon des moins de 30 ans, at the Galerie des Beaux-Arts in Paris, and in 1950 he holds his first solo exhibition at the Galerie René Drouin, also in Paris. Ever since the end of 1950 Mathieu forms a close partnership with the Gutai group in Japan. In 1950-51 he conceives the first “tachiste” artworks and begins to associate to his paintings titles inspired by the history of France. In 1951 he organizes, together with the art critic Michel Tapié, the exhibition Vehémences confrontées, first international panorama of the main lyrical abstract artists. Three years later, he has a solo show in New York, sign of the international recognition of his art. In Tokyo in 1957, he painted 21 works in three days; this fusion of painting and performance anticipates the performance art. Other notable solo exhibitions have taken place at the Kootz Gallery in New York, where he exhibits regularly throughout his life (the first in 1954), the Institute of Contemporary Arts, London (1956); Museu de Arte Moderna, São Paulo (1960); Musée d’Art Moderne de la Ville de Paris, (first Paris retrospective, 1963); a retrospective at the Grand Palais, Paris (1978); and at the Jeu de Paume, Paris (2002). Since 1966 he also dedicates to the decorative arts, creating posters for Air France (1967), the tapestry cartoons for the Gobelins (1968-1969) and the ten-franc coin.